SÃO PAULO, BRAZIL – Thousands of Brazilians took to the streets on Thursday as protests in cities across Brazil continued. In Fortaleza, capital of Ceará state, around 5,000 people had initially taken to the streets in a peaceful march, but violence later erupted and police used rubber bullets to disperse a small, but violent group of protesters. A car belonging to a TV company was torched and at least 111 people arrested as violence erupted at a protest in Fortaleza on Thursday, image recreation. At least eight people were injured and at least 111 people were arrested, local authorities said. 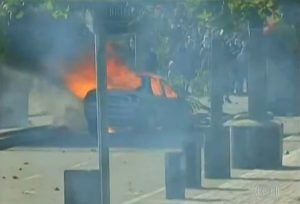 A car belonging to a local TV station was torched in the unrest. The city had been playing host to the second semi-final match of the FIFA Confederations Cup; Spain won the match against Italy and will take on Brazil in the final on Sunday at Rio’s Maracanã stadium. It is expected the final will attract further protests. Police say around 5,000 protesters also took part in a demonstration in Rio’s Candelária neighborhood in a mainly peaceful protest. A small protest was also held earlier on Thursday in the city in response to the deaths of at least nine people during a police operation in the Complexo da Maré favela on Tuesday. “The bullets they fire at the protesters in the Zona Sul (South Zone) and Centro are made of rubber. Here in the favela, they are not,” Patricia Vianna, a representative of the Redes da Maré non-governmental organization, was quoted as saying. Around 2,000 people also joined a protest on Thursday morning in Brasília to call for a vote on the National Education Plan. After meeting with student representatives, the President of the Senate, Renan Calheiros, later confirmed the proposal would go to a vote next week. President Dilma Rousseff also met with number of leading politicians on Thursday to discuss proposals for political reforms, over which the public has been promised a referendum. However, in a comment that suggested a firmer line from the government after days of concessions, Education Minister Aloizio Mercadante said that although the referendum would “guide” the process, the “final word” over new laws would be given by the government.